LOVE this! These 7 wood blocks spell at least 16 different words (and you might be able to find more)that cover every season and almost every holiday. When I saw this idea, the biggest decision I had to make was what color to paint them! I did change it up a little bit–instead of pre-made blocks, I bought 4×4 posts at Home Depot and cut them into 4 inch squares. It was immensely less expensive to do it this way, and I like the larger size. Found your blog today…love it! Great ideas. I also found your blog today and have really enjoyed looking at all of your projects. (Hope you don't mind.) I really like these blocks and the fact you can change them to so many different words. Thanks for sharing this. I think I need to head to home depot for a 4×4 post! Thanks for the idea. I love your blog!! You have such cute ideas! Oooo… I love this! I am filing it away at thecraftersfilebox.blogspot.com. Adoreable idea! Im gonna have to try it out!! Someone is much smarter than me to have figured this out! OMG, One project, every holiday!!! Got it covered. Also thx for info on cutting the boards down, knew there had to be a more cost effective way of doing this. Love the blog gals!! Do you know a good place to buy vinyl? I have a bunch of ladies that want to get together and do this project. I am in charge and do not know the first thing about vinyl lettering so any info would be greatly appreciated! I was thinking that if I changed the "L" with an "S" than I could get the words LOVE and BELIEVE out of these too..However, I dont want to mess up all the other words by switching them! My brain doesnt want work right now for me to figure it all out and make sure. So I think I am goign to have to make them first and wait to put on the "L" and "S" and see if the other words will still work. What do you think? 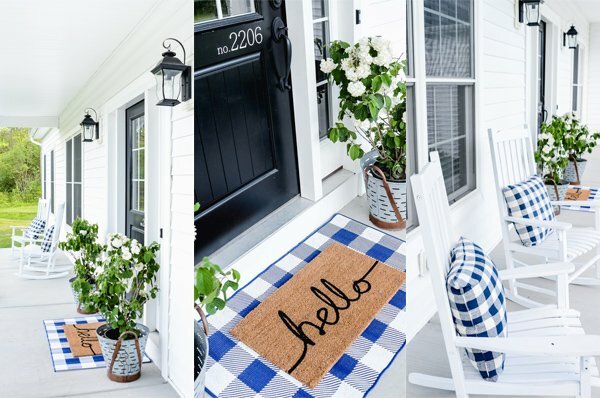 @Heather Mills: Cricut makes adhesive vinyl in 12"x24" sheets. You can cut it by hand but if you know anyone with a cricut machine, ask them to do it for you on their machine. Actually, I think the small ones are getting pretty inexpensive… you might want to just buy one if you have other uses for it too. I love mine! of course, you could also hand letter them or make stencils from card stock. Also, what's to stop you from putting letters on the other two sides of each cube? that way you could get the L for LOVE and BELIEVE. Just as long as you make sure the cut sides are sanded smooth. I love these! Can you tell me what color red paint you used and what color vinyl? thanks so much! 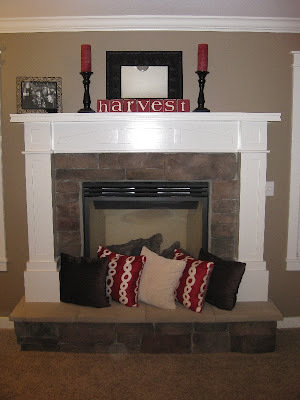 I used a spray paint by Rustoleum–Colonial Red, and the vinyl is cream! LOVE the blocks! We are so doing this for a craft night for my ward! (and the pumpkins too) Thanks for the great ideas! I LOVE your blog. I'm thinking of using these as family, friends christmas gifts. 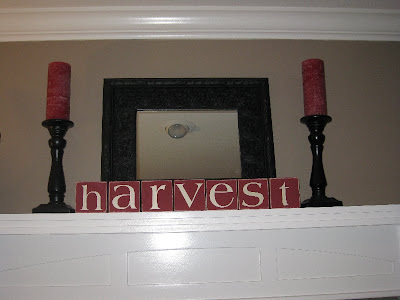 Though, I am new to vinyl lettering and am somewhat intimidated by the idea. What are some options on finding simple vinyl lettering? Thanks for all your GREAT ideas. beanandcarolyn–There is a link in my right sidebar that will take you to the site I use for vinyl lettering. It will give you lots of ideas of quotes, fonts, colors, plus ways to use the lettering. Call and talk to Becky–she's great to work with, and will walk you you anything you need! I made these today for my mom for her birthday. I don't want to give them to her!! I am going to have to make another set for myself now! Thank you!!! i was wondering what you have the other sides painted as? thanks! All sides are painted red, and only 4 sides of each block have the vinyl on them. The other 2 sides (the rough sides, where the wood was cut) are still red–just no vinyl. Is that what you mean?